Police say the woman was acting aggressively and had been stopped for using drugs on the street. A Montreal man says he witnessed an SPVM officer slam a woman's head against the trunk of a police car, and then strike her in the back of the head. Jeremiah Hayes told CBC News he was on his bike around 4:15 p.m. Thursday when he saw two police officers trying to put a woman into the back of a police car near the corner of Berri and Ontario streets. The woman was screaming and appeared to be in pain after the officers put her arm behind her back, Hayes said. "She was wiggling a bit from that pain, from what I could see, and at that moment, one of the guys slammed her head against the back of the trunk … and then again with another blow with his fist to the back of her head," he told CBC News. Hayes took a video of the incident and sent it to CBC Montreal. Montreal police say the woman had been using drugs and was acting aggressively. In the video, the woman can be heard repeatedly screaming in French: "My arm hurts!" One of the officers then slams her head against the back hood of the car, and he then appears to raise and slam down his right fist. "Hospital, please!" she then screams. "Ambulance, please!" A few moments later, she's placed in the back of the police car. "She definitely didn't deserve to be treated like that and hurt, and hit in the back of the head. Nobody does. Nobody deserves that," he said. After the woman is placed in the police car, one of the two officers goes to pick up a backpack and articles of clothing lying nearby on a small stoop, the video shows. The items were near a white blanket. Hayes said it appeared as though the woman was homeless. On Friday, Montreal police told CBC News that police patrolling the area saw the woman using drugs, and that she bit one one of them on the arm as they intervened. 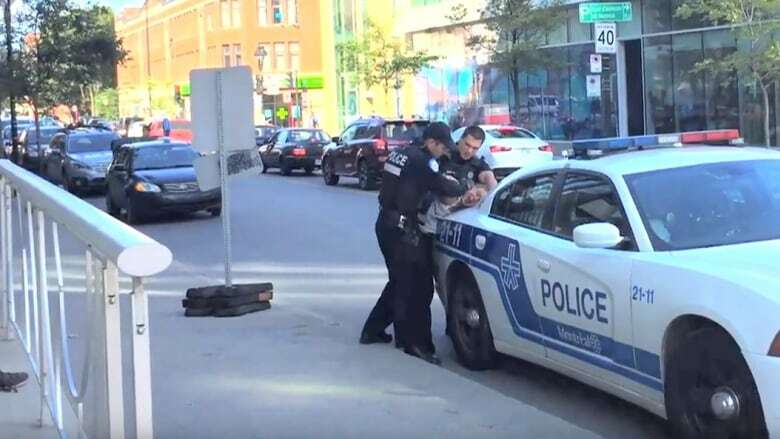 "The officer in question tried to remove his arm, but unable to do so he gave the woman blows to the head," Montreal police spokesperson Jonathan Martel told CBC News. The woman was charged with assault and drug possession and was released Thursday night on promise to appear in court. Martel said the SPVM could not confirm at this time that the woman was homeless. He also said it was too early to judge whether the force used by the officer was excessive and that a report of the incident was being filed. After watching the video shot by Hayes, Georges Ohana called the incident "horrendous" and "appalling." Ohana is the director of social housing, urban health and research at the Old Brewery Mission, which provides shelter and other services to Montreal's homeless population. He said that officers need proper training to know how to communicate with a distressed homeless person. "Training is not going to happen overnight," said Ohana. "We need to work with them as soon as they become recruits." Over the last two years, the Old Brewery Mission has trained more than 300 officers in what Ohana called a portrait of homelessness in Montreal, including how someone can end up homeless and what they experience once they're on the street. The incident happened on the same block as the offices of Dans la rue, which provides support to youth who are on the street or are at risk of becoming homeless. 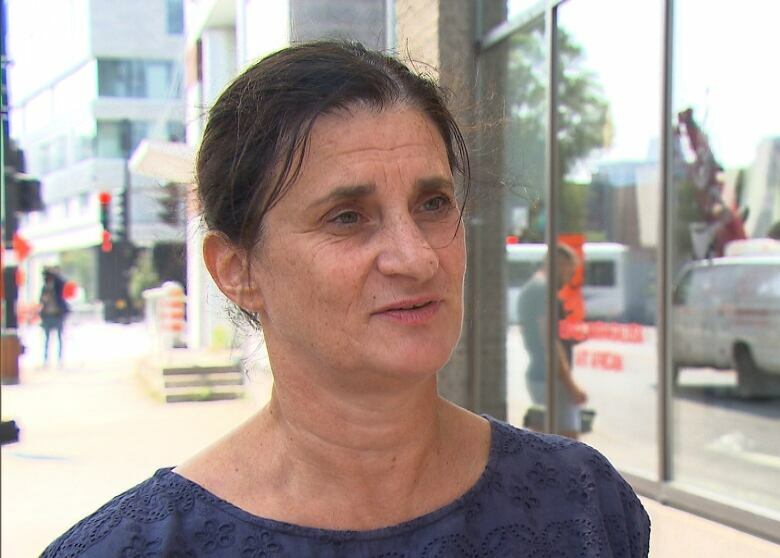 Executive director Cécile Arbaud said that the officers weren't justified in slamming the woman against the cruiser, even if she did bite an officer. "It's shocking. It's violent," she said of the video. Despite this latest incident, she says she has heard that, overall, police interactions with homeless people are improving. However, Arbaud said she did not know the woman and that no one from Dans la rue had seen her before. Violent incidents involving police have gained increased public attention in recent years, prompting outcry and calls for police officers to wear body cameras while on patrol. Ohana said police wearing body cameras would be helpful in situations like these, but that they must be accompanied by thorough training of officers as to what can trigger a violent outburst. He said it's "tragic" that it takes bystanders filming such confrontations with at-risk people to bring about a change in police behaviour. "It takes only one incident and you lose everything that you've gained," he said.